FISHKILL, N.Y. -- The Hudson Valley Renegades, Short Season Class-A Affiliate of the Tampa Bay Rays and three-time NY-Penn League Champions are excited to announce the staff that led the Renegades to the NY-Penn League championship series in 2018 will return to the Hudson Valley in 2019. Blake Butera will pilot the Renegades for the second consecutive year. Butera was named the Renegades Manager by the Tampa Bay Rays in April of 2018 following the promotion of Craig Albernaz to Bowling Green. Butera, a native of Madisonville, LA played collegiately at Boston College and was drafted in 2015 by the Rays in the 35th round. Last year he led the Renegades back to the NY-Penn League Championship series where they lost to the eventual NY-Penn League champion Tri City Valley Cats. Butera, 26 is the youngest manager in Renegades history. 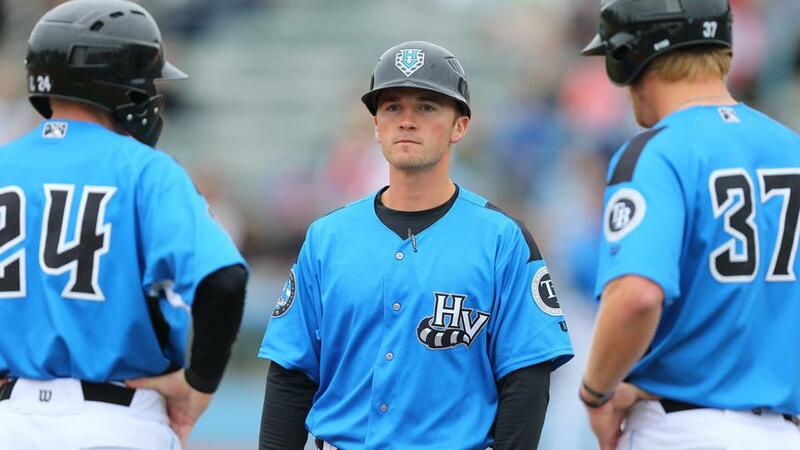 "I am extremely excited to return to Hudson Valley in 2019" said Butera. "We have had a tremendous experience with the fans, staff and the entire Hudson Valley community. We look forward to getting back to work and seeing everyone again in June." Pitching Coach Jose Gonzalez also returns for his second season. Gonzalez, a native of The Dominican Republic pitched professionally for the Chicago Cubs. He spent four years with the Cubs prior to joining the Rays organization in 2018. Alejandro Friere, another Venezuelan native is back for his third consecutive year as the Renegades Hitting Coach. Friere made his Major League debut with the Baltimore Orioles on August 9th, 2005 and will maintain hitting duties for the Renegades. Sean Smedley also returns the Hudson Valley for his second season. Smedley was signed as a free agent by the Rays in 2013. He is a former catcher and Colorado native. Tsutomu Kamiya and Dan Rousseau round out the Renegades staff for 2019. Kamiya is back for his second year as the Head Athletic Trainer and Rousseau returns to the Valley for his seventh year as the Strength and Conditioning Coach. The Renegades opening day is Sunday, June 16th with a special Father's Day 4:05 p.m. start against the Lowell Spinners. Call the Emery & Webb Box Office at 845-838-0094 and ask about Season Ticket Memberships, mini plans, group outings, picnics and skyboxes or go online to hvrenegades.com for our schedule and more information. The Hudson Valley Renegades are the New York-Penn League Short Season Class A Affiliate of the Tampa Bay Rays. The Renegades won league championships in 1999, 2012 and 2017. All home games are played at Dutchess Stadium. For more information, please call 845-838-0094 or visit hvrenegades.com.